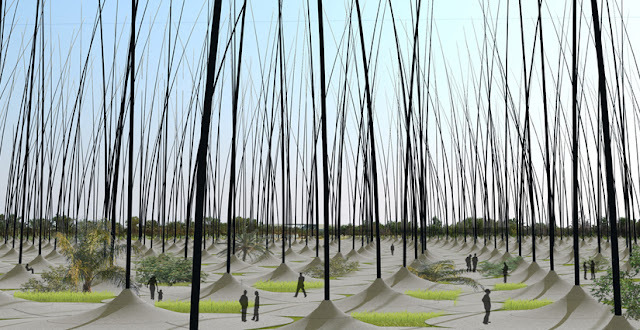 The proposed design calls for 1,203 "“stalks," each 180-feet high with concrete bases that are between about 33- and 66-feet wide. The carbon-fiber stalks, reinforced with resin, are about a foot wide at the base tapering to about 2 inches at the top. Each stalk will contain alternating layers of electrodes and ceramic discs made from piezoelectric material, which generates a current when put under pressure. In the case of the stalks, the discs will compress as they sway in the wind, creating a charge. Further details at Discovery News. Neat idea, but like so many technologies it is a solution to a problem that no one has. Wind turbines are not particularly noisy (and anyone who has ever been near a flag pole in the wind knows that these will make noise too). And wind turbines don't really kill many birds at all. They do kill lots of bats tho'. http://dsc.discovery.com/news/2008/08/25/wind-turbine-bats.html Plus the whole lack of spinning blades cuts back on the wear and tear on the generators or ice flung off the blades after a wet freeze - When my husband was on the construction crew here, he said the ice drop was pretty scarey. I would think the stalks would have a longer working life span as well? I live in the shadow of the Wolf Ridge installation here in Tx and am a HUGE wind proponent, but at least 2 or 3 heads are always off-line and the entire 75 rarely run all at the same time. They have already had to replace 1 of the heads in less than 4 years due to generator failure. I saw these windbelts presented in a class when I was in school, just another linear technology to add as an alternative. Wind turbines aren't particularly noisy, but they are still very subject to NIMBY-ism, perhaps a more beautiful harvesting solution would work better in some areas than the more typical turbines. These are quite beautiful, and very expressive of the purpose that they serve. This wouldn't look out of place in an inner-city park setting at all, perhaps the design firm was trying to come up with something that could serve New York right out of their city parks. Interesting concept, although to me the depiction reminds me of a closeup view of fleas on a dog. There has got to be a connection in there somewhere with New York, people and parks, just can't think of it, haha. First time I saw these, in was in a Reiser comic. I think the comic dates back to the 70s - reiser was way ahead of his time on these matters - and others. As is normal, no numbers are given with which to assess something like this. As an engineer, I am skeptical off this stalk concept. I've worked with industrial piezo rings before (about 6" diameter). One would have to use industrial grade rings to give the robustness to last. (How do they get maintained or replaced?) The output on mine was maybe a couple hundred millivolts - only enough for a signal. Piezo is DC current, and tends to be very low in voltage. The amount of bend for each piezo disk is very small. Not only that, but once bent the stalks will tend to stay bent under a constant wind. So the piezo only happens when the wind fiorsts comes up, and the only for the small amounts of VARIATIONS. While a novel idea, I think this is an almost useless concept. The power out will be much less than windmills (which I loather with a passion). In the direction of nolandda's comment, anyone who has ever been around a woods in the wind knows there can be quite a bit of wind noise. I think at 12-13 knots (the average for U.S. cities) the noise will be reasonable, but it won't give up much power. In case anyone hasn't noticed, the windmill energy thing seems to be collapsing all over the place. Germany's biggest manufacturer is going defunct, and the USA's most subsidized one went bankrupt already. Even at its height, the percentage of power produced has been what? 1.2% of total energy produced? Why don't they just wrap piezo material around branches of REAL TREES? The idea that wind mills kills birds is a story of left-out data. Yes, birds fly into wind mills. But they also fly into sky scrapers and other high objects. Do we object to those? Most importantly, nobody ever counts the amount of birds that die due to pollution of other power plants. Because it's harder. Coal power plants bill birds through climate change. Nuclear power plants kill birds through their waste, possibly 10,000 years from now.